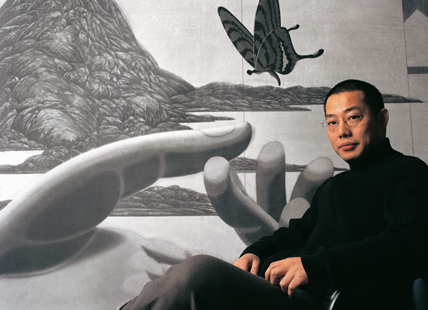 Chen Qi has bravely transformed and moved beyond modernism, incorporating the lighting ideas of Western paintings and expanding water-based printing beyond its original limitation to Chinese ink painting and modernist aesthetics since the very beginning of the ’85 New Wave. He explores water-based printing’s contemporary expressive abilities through independent artistic language. His printing process dampens the limitations of the original draft and makes use of the artist’s subjective consciousness in the process of creation. The flow of consciousness is conveyed through the improvisational spirit and the free-moving marks. Especially praiseworthy is his attention to the conceptuality that arises from the creative methodology of water-based printing as a component of cultural heritage, entering into contemporary experimentation that transcends aesthetics. 1987 BA in Drawing, Nanjing University of the Arts. 1987 The Third National Three-edition Exhibition. LuXun Printmaker Award by Chinese Artists Association etc. China National Art Museum, British Museum, Victoria & Albert Museum, ShangHai Museum, GuangDong Museum, Sotheby’s Institute of Art in London, Ashmolean Museum in Oxford, New York Public Library, Fukuoka Asian Art Museum, European Woodcut Foundation etc.